LMU cancer researcher Thomas Grünewald has been awarded a Max-Eder Grant by the German Cancer Aid (Deutsche Krebshilfe), which will enable him to extend his work on the genetic and molecular basis of Ewing sarcoma. 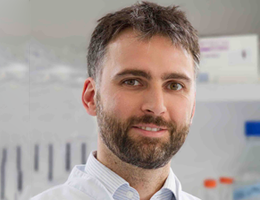 The pathology resident Dr. Thomas Grünewald, Head of the Laboratory for Pediatric Sarcoma Biology in LMU‘s Institute of Pathology, has been informed by the German Cancer Aid (Deutsche Krebshilfe) that his application for funding of a Max-Eder Junior Research Group has been approved. Grünewald’s research is concerned with the pathogenesis of Ewing sarcoma, a type of bone cancer that typically presents in children, adolescents and young adults. The new Max-Eder research group will focus on elucidating the contribution of the oncogenic interaction between germline variation and somatic mutation to the progression of this pediatric bone cancer. The tumor cells that make up a Ewing sarcoma all carry a single somatic “driver” mutation, which results in the fusion of two genes to form the oncogene EWSR1-FLI1. However, the presence of the fusion gene alone appears not fully sufficient to provoke tumorigenesis in all cases. “Indeed, genome-wide association studies have shown that genetic variations in the germline play a much more significant role in promoting the induction of cancer during childhood than they do in later life,” says Grünewald. Hence, the immediate aim of the project is to explore the interplay between innate genetic variability and acquired somatic mutations, and its impact on the clinical course of pediatric cancers, using Ewing sarcoma as a model system. The proximate objective is to use these findings as a basis for the development of personalized treatments for these cancers. Thomas Grünewald already has received a number of distinguished research awards. In 2015, he was awarded the Kind-Philipp Prize, the Gerhard Domagk Prize and the International Research Prize presented at the annual German Sarcoma Conference for a paper that was published in Nature Genetics. In that report, Grünewald and his colleagues demonstrated, for the first time, how the fusion gene EWSR1-FLI1, generated by a spontaneous somatic mutation, interacts with a specific (and otherwise harmless) germline variant to promote the development of Ewing sarcoma. In addition, Grünewald is the recipient of a fellowship worth 40,000 euros, awarded by the Daimler and Benz Foundation to enable him to identify drug targets specific to the tumor cells, with a view to developing effective therapies for the disease. The Max-Eder program honors the Munich pathologist of the same name, who was Professor of General Pathology and Pathological Anatomy at LMU, and was a pioneer and strong supporter of the German Cancer Aid. The program provides funding of up to 800,000 euros for four years in the first instance.